Dr. Frank-N-Furter - A Scientist: He'll eat nutritious, high protein and swallow raw eggs... Tried to build up his shoulders, his chest, arms and legs. Such an effort, if he only knew of my plan. In just seven days I can make you a man. Q: When I started to attend Midnight Showings, they had the U.S. version of the film. Why do they only show the U.K. version these days? Q: Is the U.S. version on the DVD or Blu-ray the true U.S. version? Q: What's the difference between the US and UK versions? Moving on from the riotous cult stage show which was born in a small studio theatre in the early 70s, this movie version is a well-cast, outrageous romp showcasing the absurdity and sci-fi obsession of Richard O'Brien's inventive musical. The small cast - the wonderful Tim Curry as Frank 'n Furter (the sweet transvestite from transsexual Transylvania'); Barry Bostwick and Susan Sarandon as the odd science students Brad and Janet; Patricia Quinn as Magenta ('a domestic'); Little Nell as Columbia ('a groupie'), Jonathan Adams as Dr Scott; Meat Loaf as Eddie; Richard O'Brien himself as the handyman Riff Raff; Peter Hinwood as the muscle man Rocky, created by Frank in a spoof on Frankenstein; and Charles Gray having a great time as the Criminologist - are all really good, and the songs are terrific, from the madness of 'The Timewarp' and 'Sweet Transvestite', to the ethereal 'There's a Light' and 'I'm Going Home', by way of the rocky 'Whatever Happened To Saturday Night?' and the film-reference heavy 'Science Fiction Double Feature'. 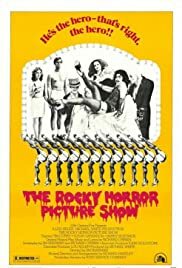 Great, great fun and the floor show sequence in particular, showcasing Frank's obsession with Fay Wray and the RKO cheapies, is exceptional, with its statues in basques and its huge swimming pool. Trash, yes, but classy trash, and most enjoyable. 81 of 108 people found this review helpful. Was this review helpful to you?